In the city of Venice it was believed that the sacred relics of Saint Mark the Evangelist were transferred there in the year 827. As the possessors of the Evangelists's relics, the Venetians honored Saint Mark as the patron of their city, and the churches of the city teem with images depicting scenes from his life. By the time of the Renaissance, the Lion of St. Mark had become the symbol for the city itself. The other patron and guardian of Venice was the Blessed Virgin Mary, for according to legend the city had been founded on the feast of the Annunciation. It therefore seemed to the people of Venice that their city had also assumed her attributes of purity, perfection and immortality. Unwalled, their city had remained the refuge of worthy men and singularly unconquered for over a millennium. 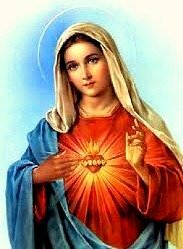 All of Mary’s feast-days were also days celebrated by the secular government throughout the entire Republic. There is in Venice a spectacular 18th century reliquary that contains an extremely rare first class relic of the Blessed Virgin Mary. Within this reliquary, which bears the personal seal of Pope Pius VI, is a bundle of the Blessed Virgin's own hair. Since the Blessed Virgin Mary was taken into heaven both body and soul after her death, it is not possible that any other physical relics of her could exist. The sole possible exception would be her hair, and this bundle of her hair had been preserved and venerated since the time of her Assumption in the Holy House of Nazareth. Recent archeological excavations have proven that the Holy House was treated as a Christian sanctuary as early as the 1st century AD. The bundle of the Blessed Virgin's hair is believed to have been brought from the Holy Land by the Crusaders, and is venerated in Venice in the Basilica of Saint Mark.